About 7 million people living along the Indian coastline, spanning over 8100 km, are depending on fishing for their livelihood. Locating and catching fish is always a challenging task. Often, the search for fish ends up in spending considerable time and resources, thus increasing the cost leading to low profitability. A reliable and timely advisory on the potential zones of fish aggregation will benefit the fishing community to reduce the time and effort spent in searching the shoals of fish, thus improving the profitability and hence, the socio-economic status. Utilizing the remotely sensed data available from various satellites, ESSO-Indian National Centre for Ocean Information Services (INCOIS), provides these advisories to the fishermen on a daily basis with specific references to 586 fish landing centers along the Indian coast. This operational service is rendered by ESSO-INCOIS throughout the year except during the periods of Marine Fishing ban imposed by Government of India and adverse sea state conditions such as Cyclones, High Waves, Tsunamis, etc. 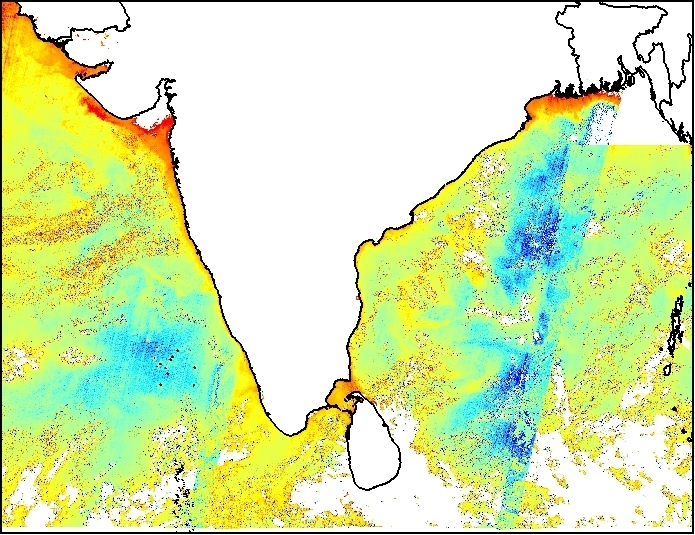 The data on Sea Surface Temperature (SST) and Chlorophyll retrieved regularly from thermal-infrared channels of NOAA-AVHRR (USA) and Eumetsat (ESA)s Met-Op series satellites along with optical bands of Oceansat-II (India) and MODIS Aqua (USA) satellites are used for the identification of Potential Fishing Zones (PFZ) along the Indian coastline. Divided over 14 sectors - viz. Gujarat, Maharashtra, Goa, Karnataka, Kerala, South Tamil Nadu, North Tamil Nadu, South Andhra Pradesh, North Andhra Pradesh, Orissa, West Bengal, Lakshadweep Islands, Andaman Islands and Nicobar Islands - the PFZ advisories are generated for each sector in the form of PFZ Maps and text. The PFZ Maps contains information on the major landing centers, bathymetry and the location of PFZ (latitude and longitude information). Due to the dynamic nature of the ocean the fishing zones identified on the maps could shift from the marked location. Hence, to guide the fishermen on the probable shifts in PFZ, the wind speed and direction information is also incorporated on the PFZ maps. This information helps the fishermen in locating the PFZ identified in the maps even if they reach the location after a day. For the comfort of fishermen, the PFZ maps as well as the PFZ text are also provided in the native languages of each sector. The PFZ Text provides the information on location (latitude, longitude), the depth at PFZ location and the distance and direction from easily identifiable prominent sites on the coast like fishing landing centre, light houses. These multi-lingual PFZ advisories are disseminated via various modes viz. telephone, fax, e-mail, website, doordarshan, radio, news media, mobile services/ mobile applications, and under funded projects to universities and partner NGOs. To improve the coverage and penetration, advances in Information and Communication Technology have been adapted. In first phase, primitive LED boards were installed at few sites on pilot basis which could disseminate information only in text form. With the state of art of Technology available, INCOIS designed and installed new generation Electronic Display Boards (EDB) at major fishing harbors' which have made significant impact in the delivery chain. These second generation EDBs are equipped with LCD monitor and thus, are capable of displaying colored maps. The 3rd-Gen. EDBs with many more utilities are under development by INCOIS in collaboration with the industry. The information communicated contains the PFZ Map and the details of PFZ text Adequate training is imparted to the fishermen in the utilization of the information including the guidance for reaching the PFZ location in the sea. The information is reaching to the coastal areas for more than a decade now. The feedback obtained from researchers working on various extensive validation projects as well as the feedback collected from fishermen indicated that the catch in the PFZ area is substantially higher when compared to the other areas. PFZ advisories were found more beneficial to artisanal, motorised and small mechanised sector fishermen engaged in pelagic fishing activities such as ring seining, gill netting etc., thereby reducing the searching time which in turn result in the saving of valuable fuel oil and also human effort.